Porcupined is surely the ugliest we make each boat during preservation. RJ and I spent many an hour sinking three round, maple toothpicks, dipped in Gorilla Glue each fasteners hole. How many? We opened and inserted 10 boxes containing 1,500 toothpicks each, and two pints of Gorilla Glue while filling every fastener hole from stem to stern and waterline to keel. 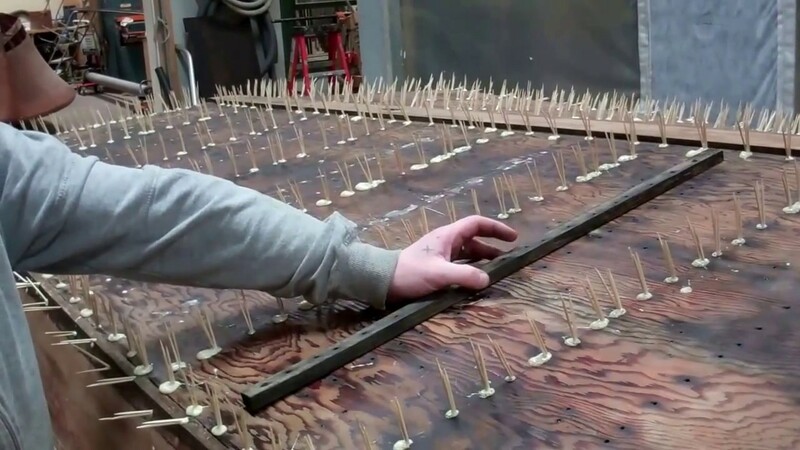 Now we are assured that the thousands of silicon bronze screws we will use to fasten the planking will bite into new wood. We allow the glue to cure for 24 hours and then shave all the offending toothpicks off the hull using our Fein Multimaster. Next comes three coats of Clear Penetrating Epoxy Sealer and the bottom will be ready for the next steps. Ahead of that moment, however, we must deal with the holes through which fasteners are sunk and fasten the intermediate frames – the battens – in place. All 32 of them must be degreased, toothpicked, sealed with CPES and installed, bedded in 3M5200. Even more tedious is dealing with the hundreds of holes left when we removed the ½ – ¾ inch pan head brass screws that Chris-Craft sank into the bottom planking from inside the bilge. RJ teased the tips of #10 screws into each of these holes, lest we generate a forest of 5200 stalactites hanging from the bilge. The bottom planking, which is in superb condition and remains eminently usable, must be scrubbed and sealed with three coats of CPES, at which time we will complete installation and the modified True 5200 bottom milestone will begin disappearing in our wake.